Jeffrey M. Verdon, Esq. 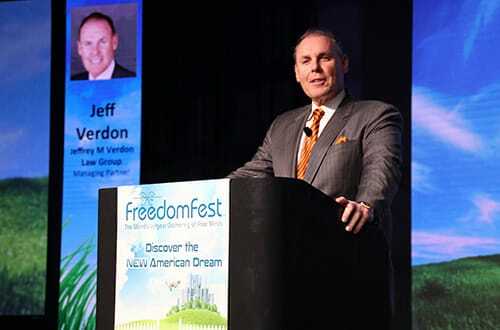 is an internationally-recognized advanced estate planning and asset protection attorney who has been presenting at various corporate and investor conferences such as the Money Show and Freedom Fest, as well as on investor cruises such as InvestorPlace Media, Crystal Cruises, and Oxford Club. Jeff is regularly featured at international speaking engagements and leads workshops in investing, estate planning and asset protection. Conference Description: Join hundreds of the world’s best analysts and stock pickers and identify the most promising opportunities in the markets today, as well as examine the catalysts that could propel the market and top-performing stocks higher. You’ll learn the best strategies for stock picking, capital preservation, and asset allocation from the best minds in the industry. Presentation by: Jeffrey M. Verdon, Esq. Conference Description: The Southpac Trust Offshore Planning Institute Conference 2017 will equip attendees with the information necessary to succeed in the evolving financial marketplace. Topic: "How to Asset Protect IRAs and Other Assets"
Conference Description: The Fourth Annual Institute, a collaboration between STEP OC and the University of California, Los Angeles (UCLA) School of Law, features many prominent, well-known faculty, outstanding and relevant curriculum and strategies for you to take back to the office and implement with your clientele. This year’s program follows on the heels of three years of incredibly successful events which met with rave reviews from attorneys, accountants and financial professionals practicing around the world. Topic: Joint presentation discussing the benefits of asset protection, covering the more important due diligence criteria for vetting prospective clients, comparing and contrasting the domestic asset protection trust with the foreign asset protection trust from both a legal and practice standpoint. Conference Description: This workshop will focus on certain tax and estate planning techniques popular with successful investors and business owners. Conference Description: The IRS wants to eliminate several popular and tax efficient strategies used by successful investors and business owners. This workshop will review several important strategies to take advantage of before the laws change. Conference Description: Take a cruise with financial experts and political pundits who discuss key issues affecting the economy and financial markets and offer personalized insights to help you achieve your own unique financial goals. Presentation by Jeffrey M. Verdon, Esq. Conference Description: The Cash Flow Wealth Summit is an opportunity to learn about true wealth building techniques and cash flow principles. Whether you are new to cash flow concepts or trying to elevate investments to a higher level, the purpose of Cash Flow Wealth Summit is to start expanding the principles and concepts that bring financial abundance. Conference Description: Over 30 hours of seminars, expert panels, and round table discussions on topics ranging from global economics, currency, energy, agriculture, real estate, wealth preservation, tax mitigation, and estate planning. Conference Description: Special Asset Protection Track. Join thousands of your fellow investors in Orlando for a three-day event that will have a substantial impact on your success in today’s markets. This conference is bringing together top investing experts from around the world with one goal in mind—helping you make better investing decisions in 2015. Conference Description: The Third Annual Institute, a collaboration between STEP OC and the University of California, Los Angeles (UCLA) School of Law, features many prominent, well-known faculty, outstanding and relevant curriculum and strategies for you to take back to the office and implement with your clientele. This year’s program follows on the heels of three years of incredibly successful events which met with rave reviews from attorneys, accountants and financial professionals practicing around the world. "For more than 25 years, Jeffrey M. Verdon, Esq. has been presenting on comprehensive estate planning topics to public and private groups around the world. His audiences consist of affluent families and business owners including comprise high net-worth successful investors, real estate developers, business owners, CEOs and officers and directors of publicly held companies, doctors, and other professionals who are at high risk for lawsuits. "Mr. Verdon also lectures regularly at local and national law firms, providing accredited CLE programs on Asset Protection: An Overview of Offshore Planning Strategies and U.S. Tax Compliance. "You were certainly the most exciting and imaginative estate planner whom I have ever met. I learned more about estate planning than I learned in law school, general practice and my years as a judge all put together.